Hi, lovely colors! And, the dog is so cute! Thank you for checking my blog earlier today. I really like your home photos. I agree! I love these colors! so, so pretty! i wish that was my kitchen! 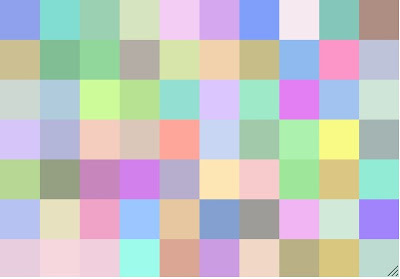 I love these colours too. They just brighten up a room or space. I do want to paint my dining room chairs a different colour like the first picture. oh! so pretty gelati colours! and that pink fridge oh la la. That kitchen is amazing! What a dreamy place to cook. You calling these gelato colors makes me happy. 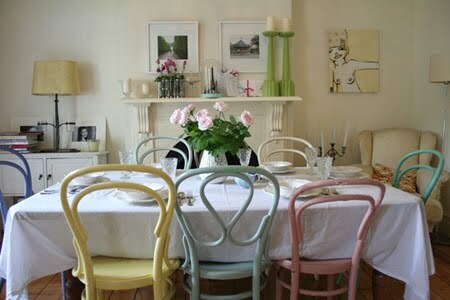 I'm just a terrible, terrible sucker for Thonet bentwood chairs, and those look so very lovely in the mix of pastel colours. Fresh and spring-y - happy weekend! I love that first pic! I adore mismatched chairs that is so cute! The colors are great...very happy! 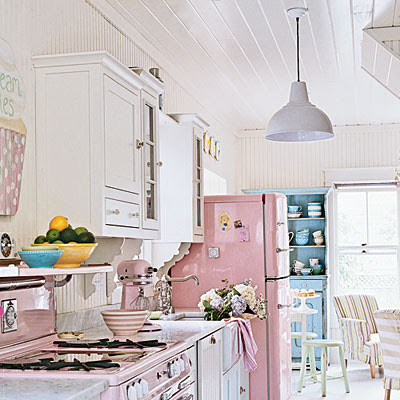 Love the pink frig, oven and mixer. How fun to cook in that kitchen. I'd live in that room! I love these colours too. 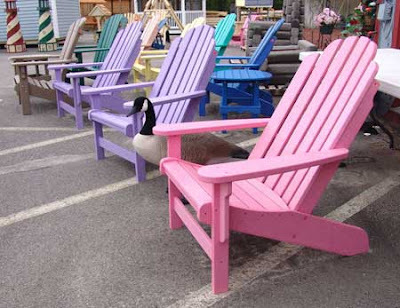 I have made a similar chair (from scratch)to those muskoka ones and painted it 3 different gelato shades and have called it my "Ice Cream Chair". I really should photograph it one of these days. Love it too. The dining chairs are fabulous. oh my goodness kelli ~ what wonderful finds! that first image from heather's home on apartment therapy is to die for. i went and visited the link to take her home tour and her entire home is utterly delicious. Love everything! The colors are great. What pretty shades! Especially love the chairs in the 1st pic. I'm usually not into pastel colors but I do love that first photo! I think I'm sold! The kitchen is similar to mine =] all my appliances and stuff are powder pink (much to my partners disgust), makes the washing up a whole lot more bearable! So pretty -- this reminds me of a lovely antique shop, that sections off vintage and antique finds into colors, and my most favorite section is this color scheme. She has sorbet bowls, chic cups, everything! The dining room chairs are really cute and festive but I absolutely love those Adirondack chairs. Those would liven up any patio. They just scream fun. OMG!! Check out that pink fridge...I soooo want one! !